During Holy Week of 1993, Bishop John Nevins approached Fr. 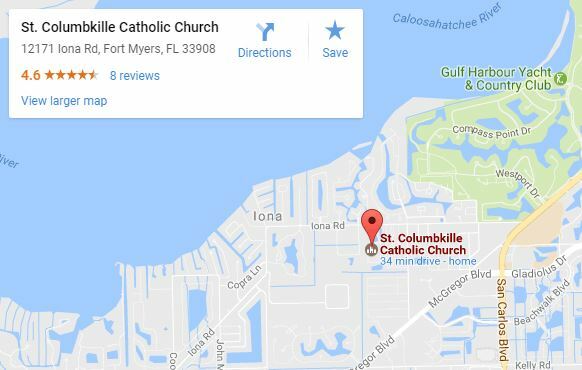 Charles Sullivan concerning the formation of new Catholic community in the Iona section of Ft. Myers. On September 13, 1993, Fr. Sullivan moved to Iona to begin this formation. On December 2, 1993, the St. Columbkille Mission of Iona was elevated to the status of a parish. On Christmas Eve 1993, St. Columbkille Catholic Church celebrated its first liturgy in temporary quarters, a series of six modular units that would serve as a temporary church for the next five years. The debt incurred by the construction of the modulars, the purchase of 20.8 acres and the landscaping and paving was soon liquidated by pledges from our generous Parishioners. On January 1, 1996, a fund-raising campaign was begun for the construction of our new church. And October 6, 1997, the actual construction began. At the onset of our parish it was believed that 500-600 households would be served. Yet amazingly our number was three times as much. Within the first year the Knights of Columbus Council, Women’s Guild and Society of St. Vincent de Paul were organized. Family Faith Formation, Youth Group for junior and senior high school students, Adult Religious Education Program and Adult and Folk Choirs all formed. These groups have made a tremendous contribution to the parish community. Along with these organizations, the priests, deacons and laity have conducted an outreach program to Lee Memorial Health Park Hospital, HealthPark Care Center Home, Shellpoint Village, Hope Hospice and the Lee County Sheriff’s Department. Daily Communion is still offered to most of these institutions. To cultivate the spirit of prayer and devotion, a beautiful grotto dedicated to Our Lady of Guadalupe and Stations of the Cross were constructed on the parish grounds. St. Columbkille Parish has been blessed through the ministry of outstanding priests and deacons. Fr. Thomas Palko, O.S.F.S., Fr. Brendan Breen, Fr. Joseph Keane, Fr. James Rogers, Fr. Genaro Testa have served so faithfully and well. Deacons Brendan Fay, Jack Gilbert, and Gil Walton have contributed greatly to the life and vitality of the parish. Deacon Brendan Fay’s prayers in heaven have certainly been experienced by all of us. Sister Adelaide Cannon’s efforts and zeal enriched our parish liturgy and educational program. Finally, where would we be without the dedication, enthusiasm and spirit of sacrifice and generosity manifested by our parishioners and friends? St. Columbkille must be pleased with this formation at Iona, Florida as he was with his foundation at Iona in Scotland. The past has been outstanding, the future will be better as we continue to build ministries, form a more vital community, and promote the Kingdom of God in our midst. © 2019 St. Columbkille Catholic Church. Design by Damian Hanley Inc.